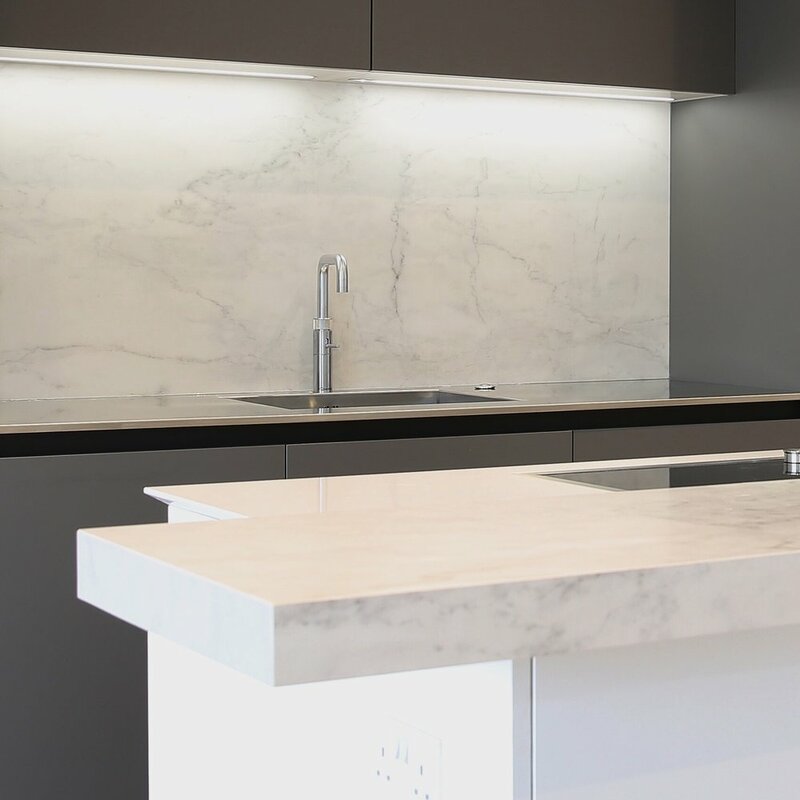 The go to material for kitchen worktops used to be quartz based materials such as Silestone. 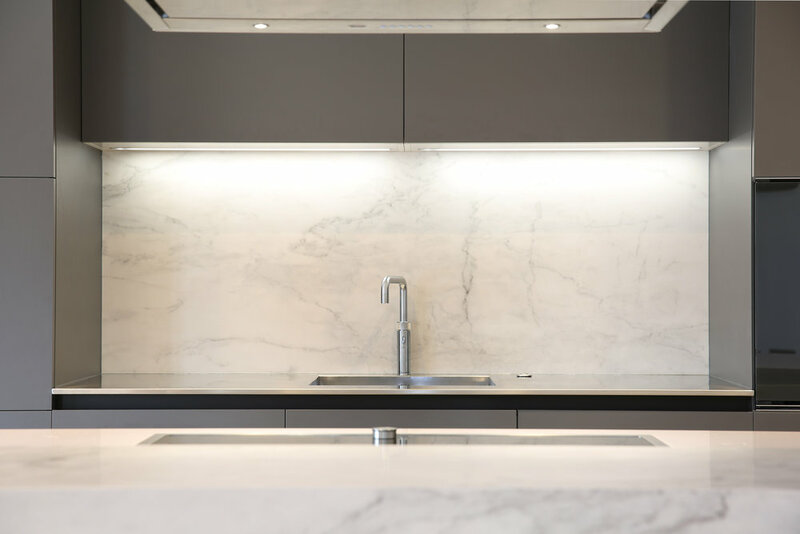 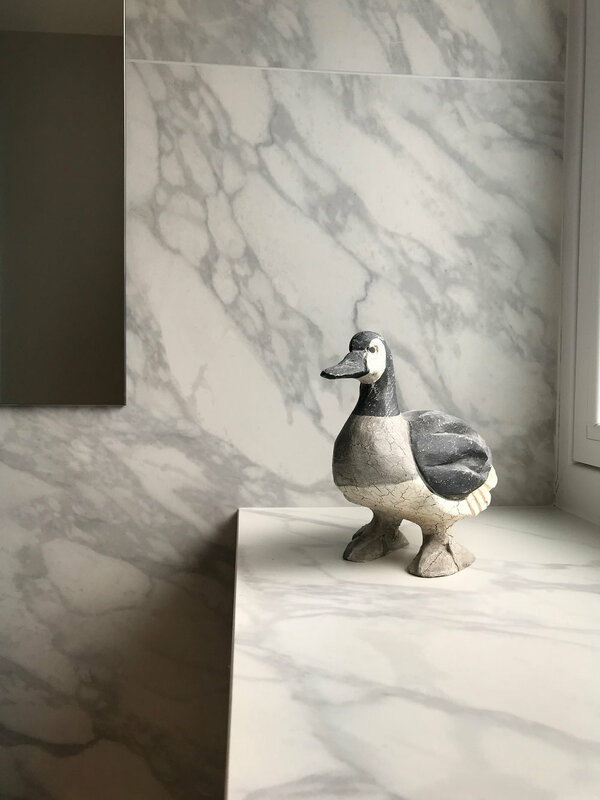 Now with the advances in porcelain production, the must have material for kitchens is porcelain: non-porous, high stain resistance, photorealistic HD printing, impact resistance and excellent thermal properties. 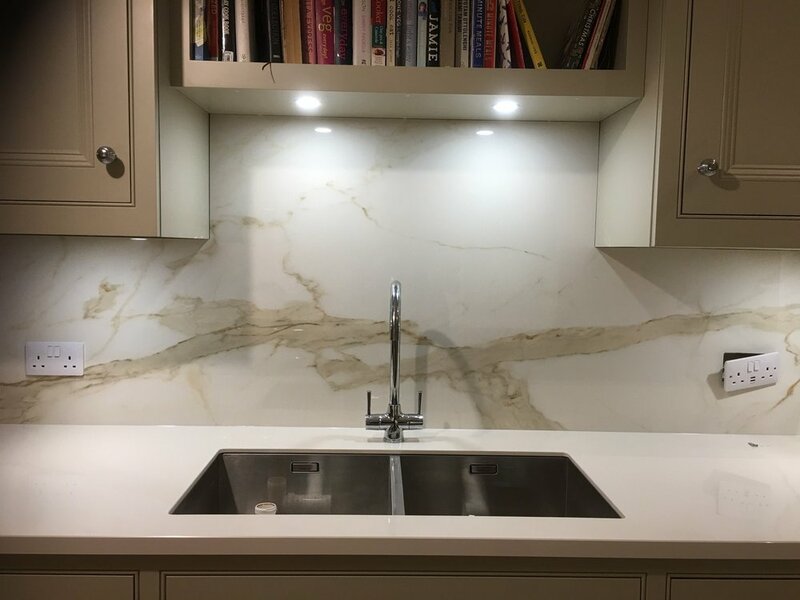 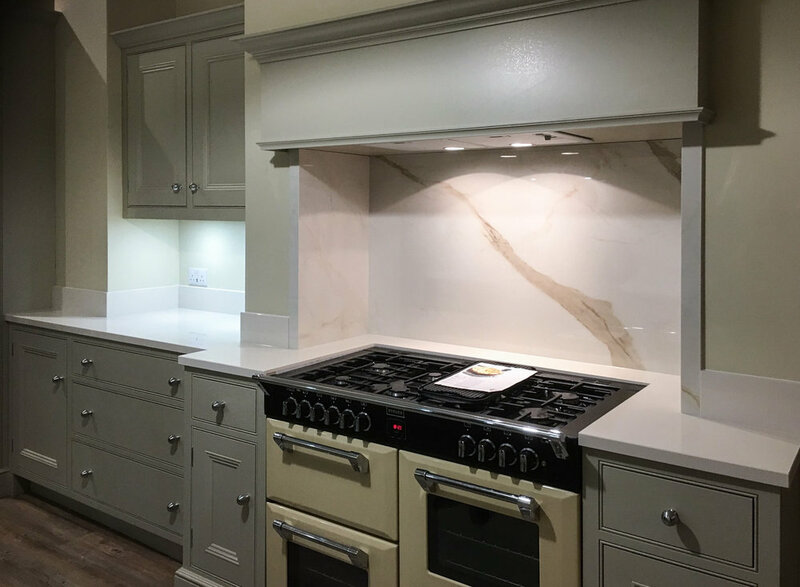 We have supplied many porcelain worktops and kitchen splashbacks. 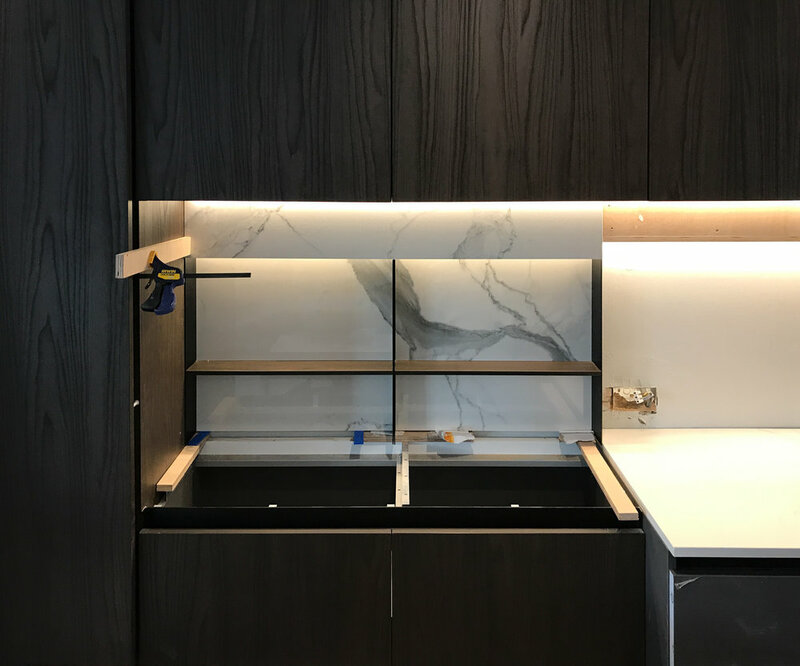 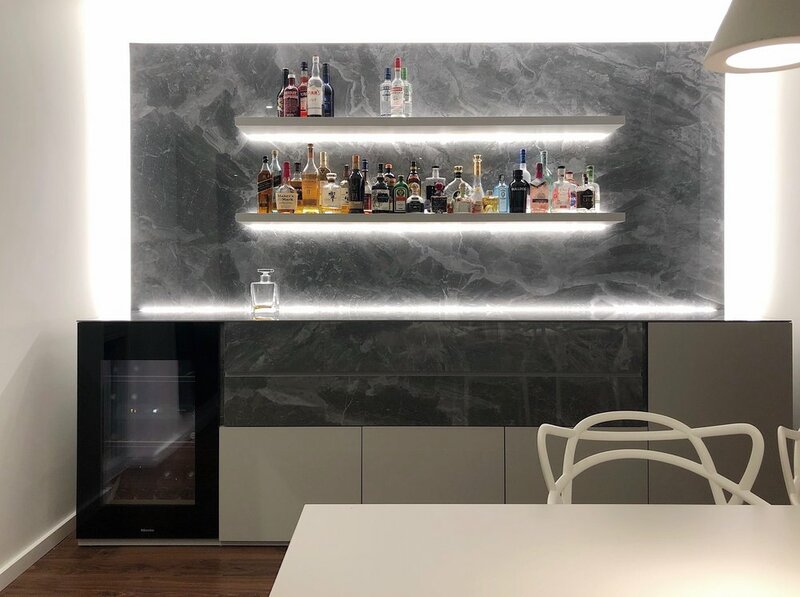 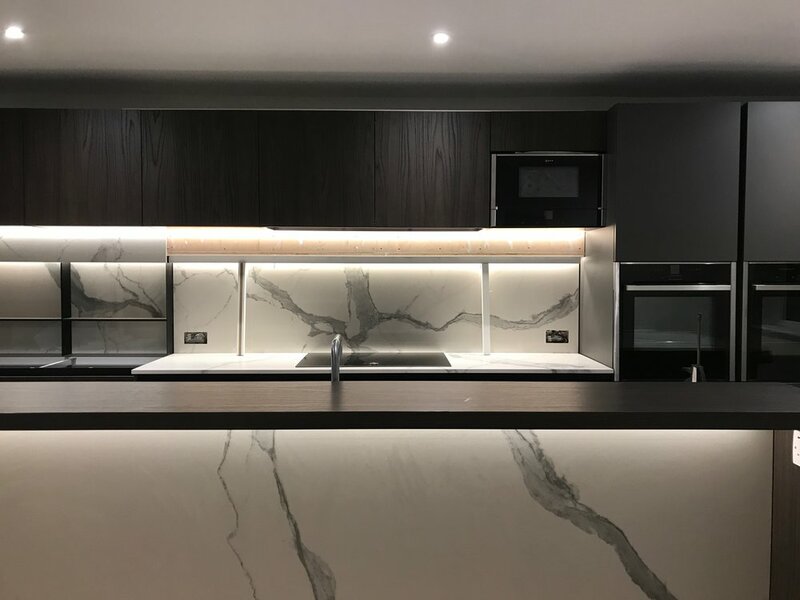 This bespoke drinks cabinet featured large format porcelain from Laminam that was waterjet cut and polished to create a striking backdrop to the furniture composition. 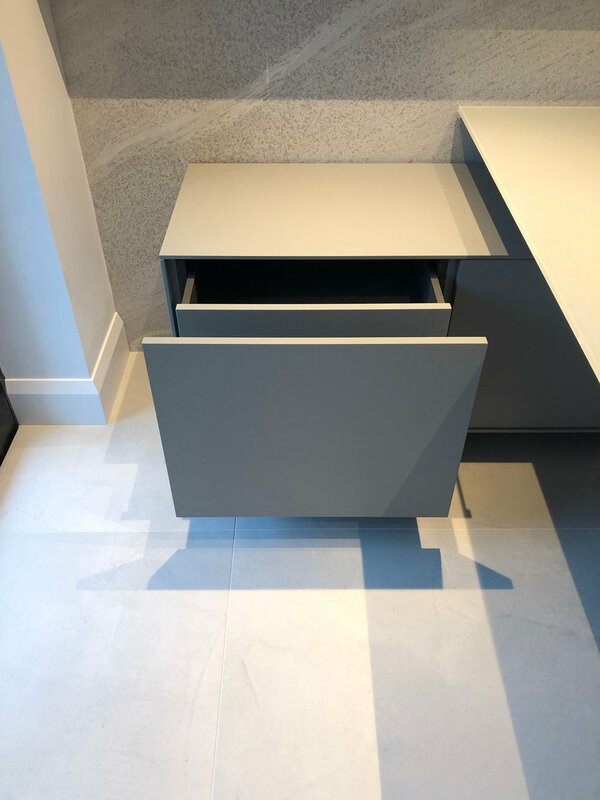 The unit top and drawer fronts were also realised in porcelain, both for their beautiful aesthetic and practicality. 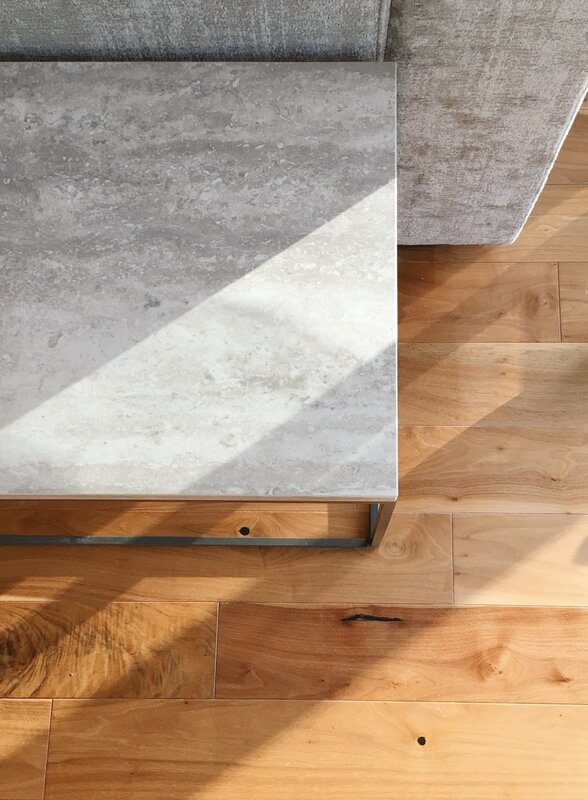 Porcelain is incredibly resistant to staining and scratching, making it an ideal choice for furniture surfaces. 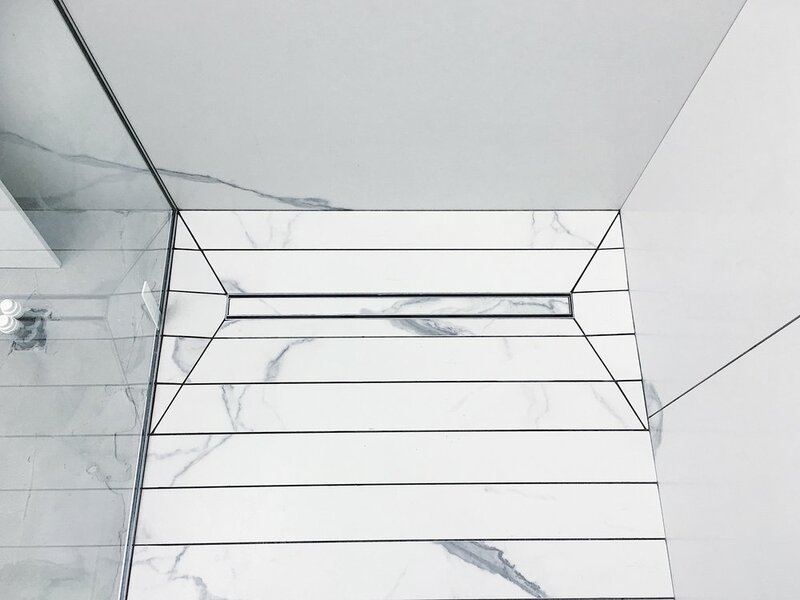 Porcelain is an excellent material for cladding staircases and architectural elements. 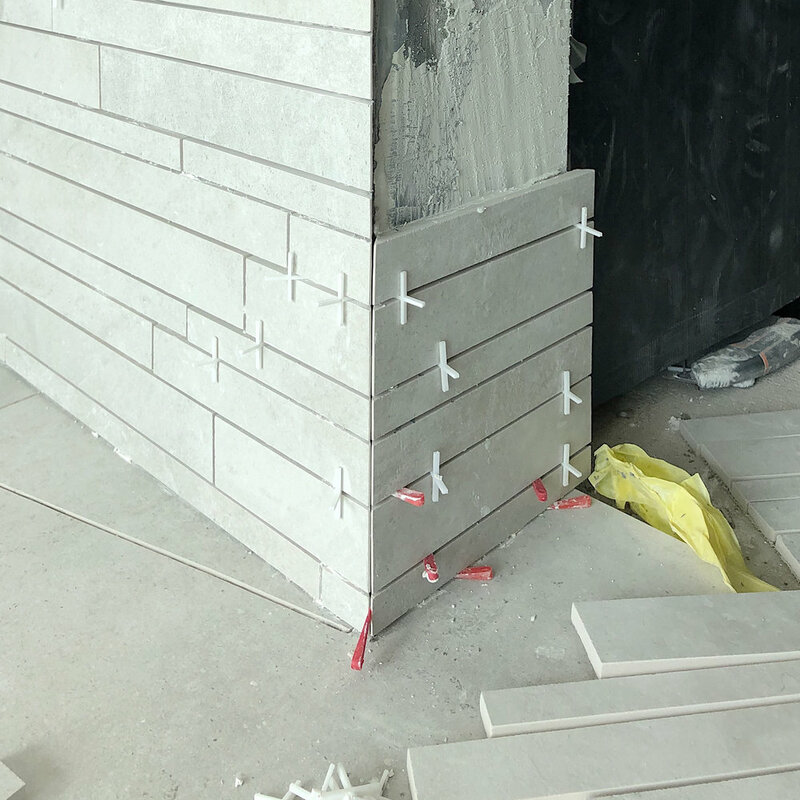 We clad the first three steps of this staircase in 10mm Dechirer 1200x1200 by Mutina. 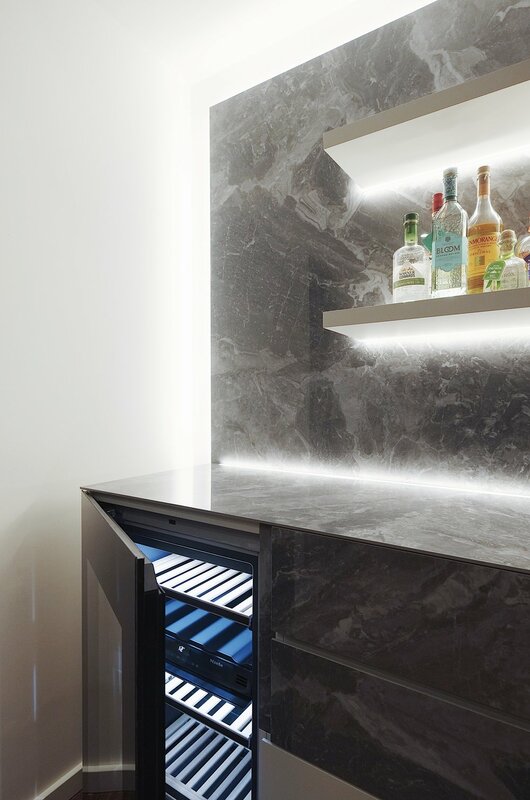 A tile characterised by the pattern and depth of texture which is highlighted further by the recessed LED lighting. 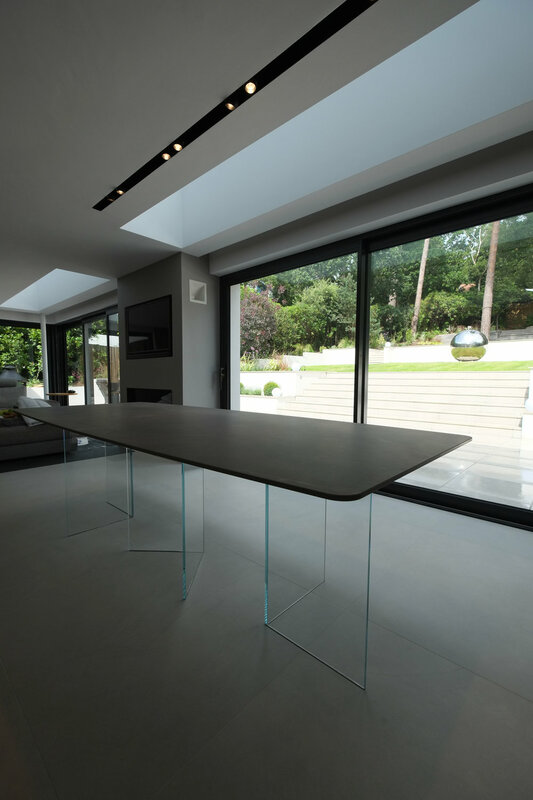 We supplied the technical drawings as well as the installation. 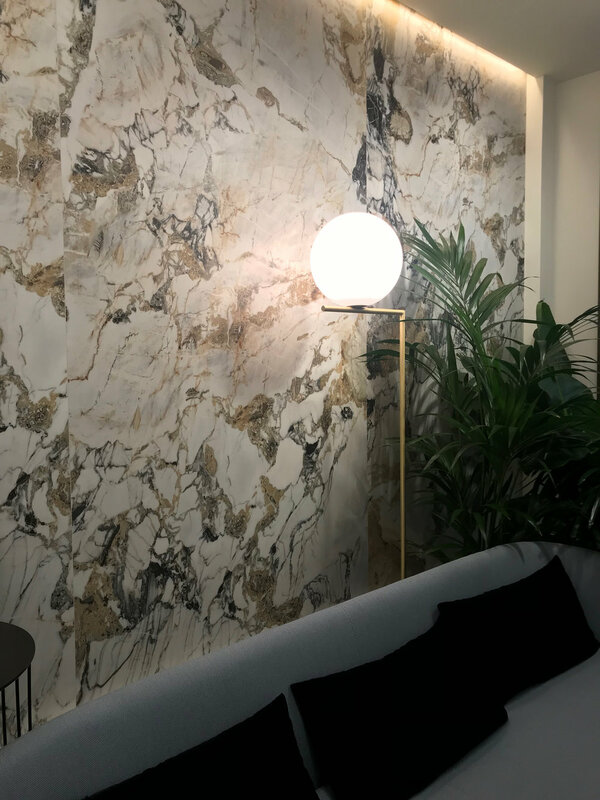 Extra large tiles are perfect for creating statement walls. 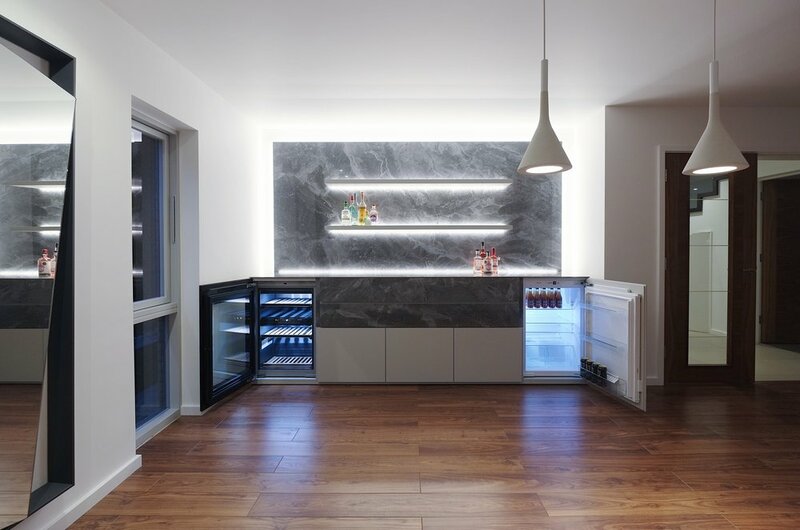 This feature wall spanned two floors in a residential apartment development. 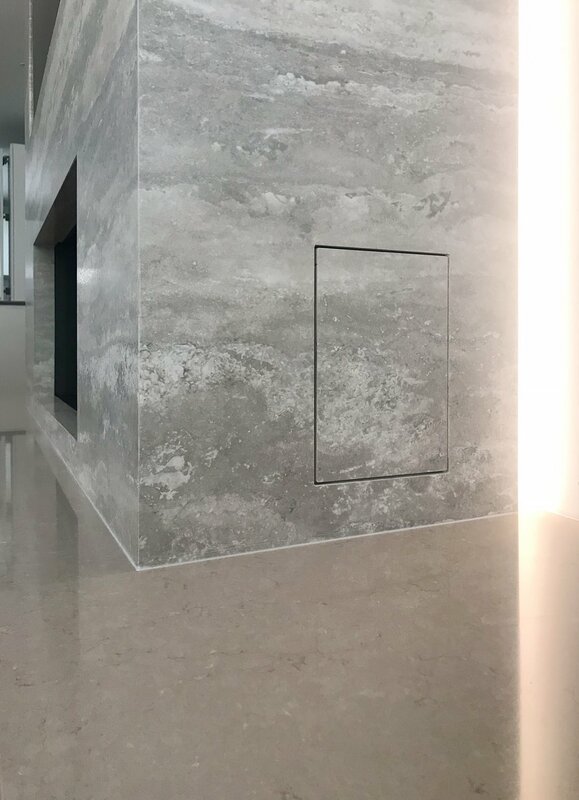 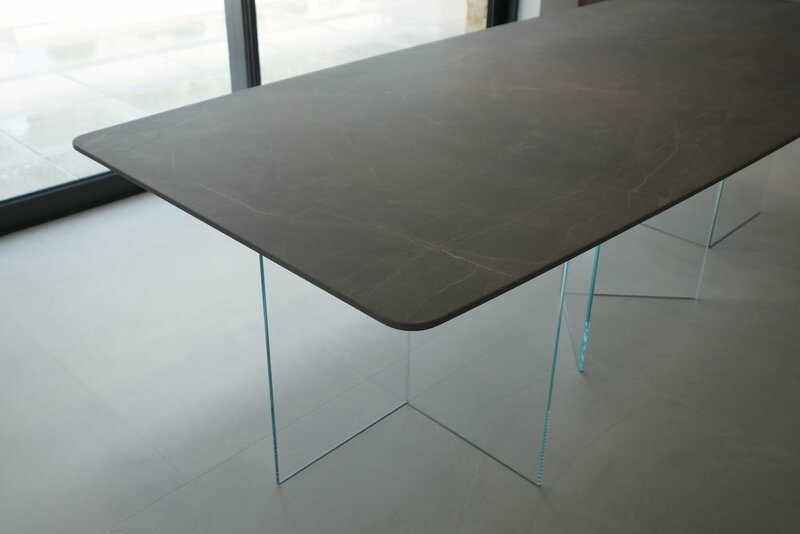 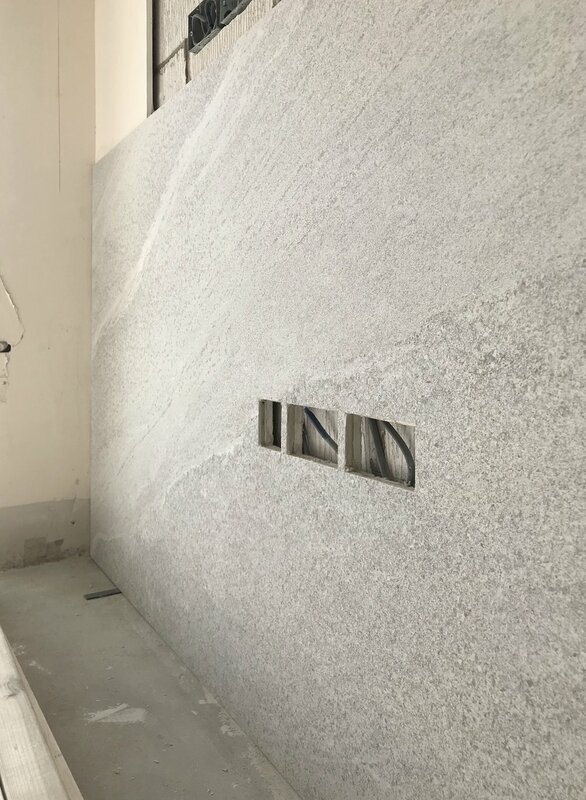 The corners were mitred to give the appearance of a solid blocks of Arabescato marble. 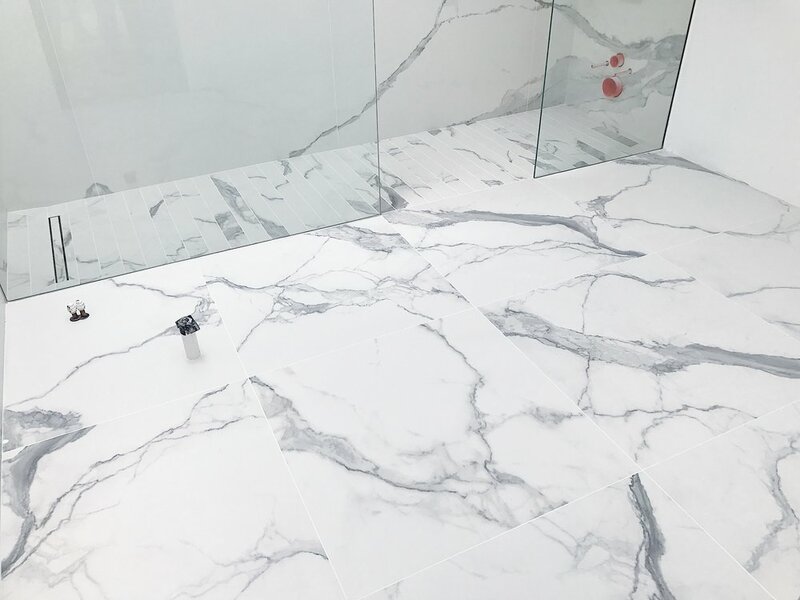 It is possible to vein match and chain link certain marble sheets to give the appearance of large solid surfaces. 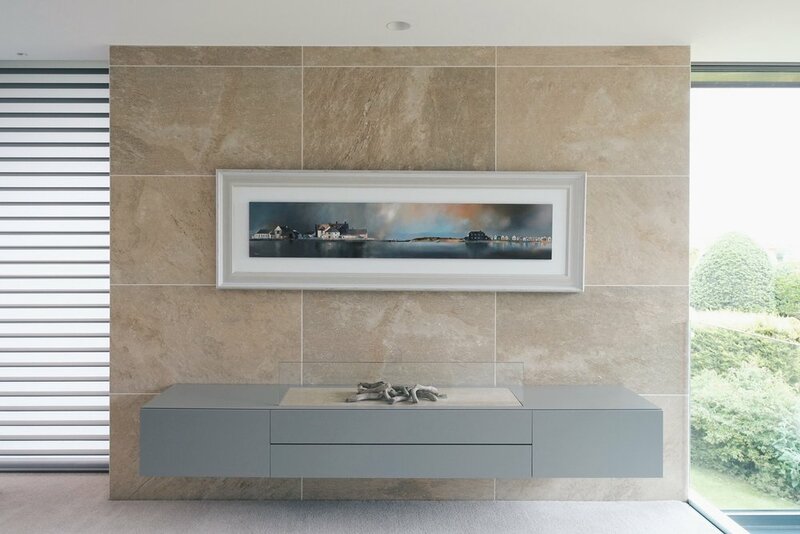 Being so close to the sea, rendered buildings look great for a limited time. 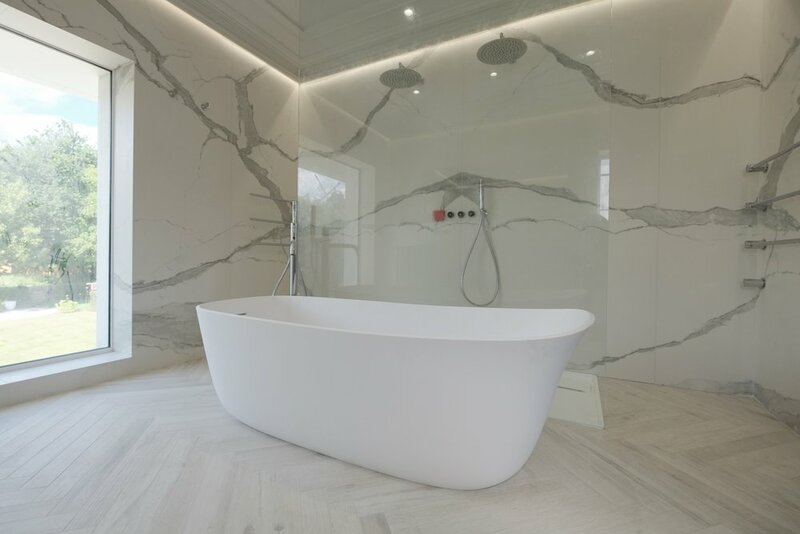 Porcelain does not discolour, is non porous and has excellent thermal properties. 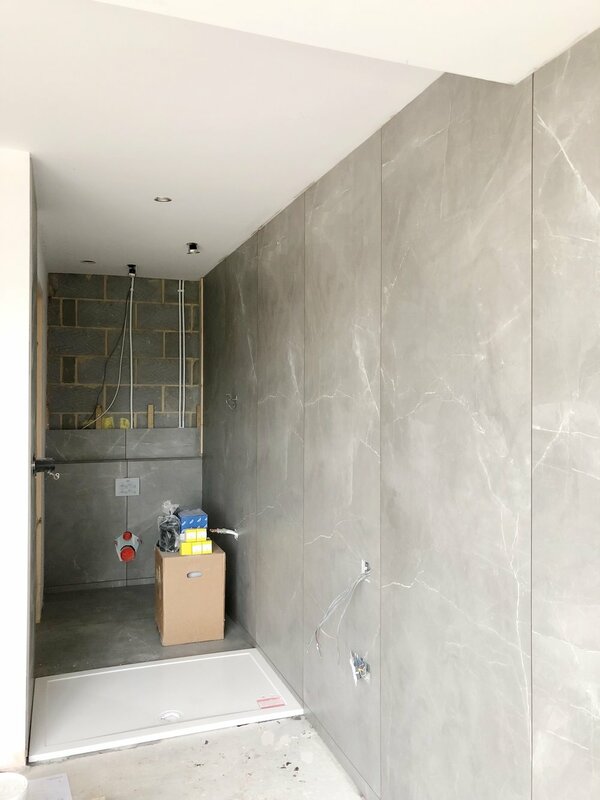 This image is taken 12 months after the Floor Gres Industrial large format has been installed on the front and rear elevations of these two properties. 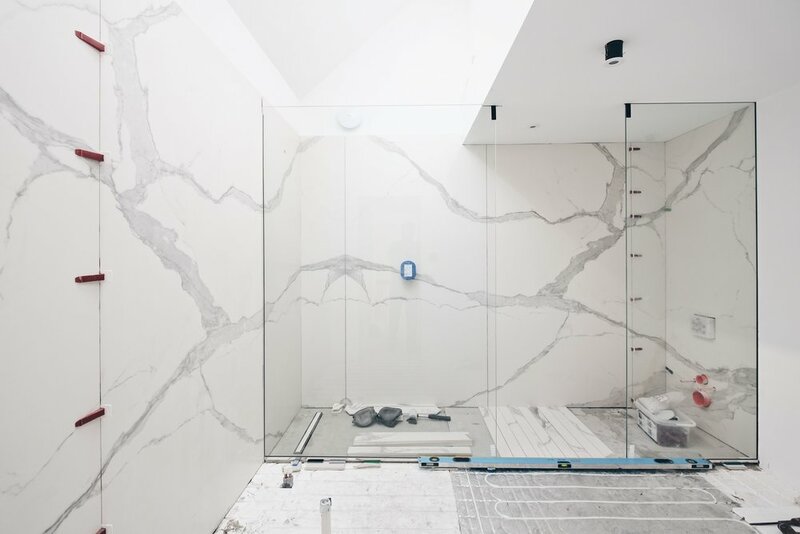 It is possible to have metal, concrete, stone and marble effect porcelain that will look beautiful throughout time. 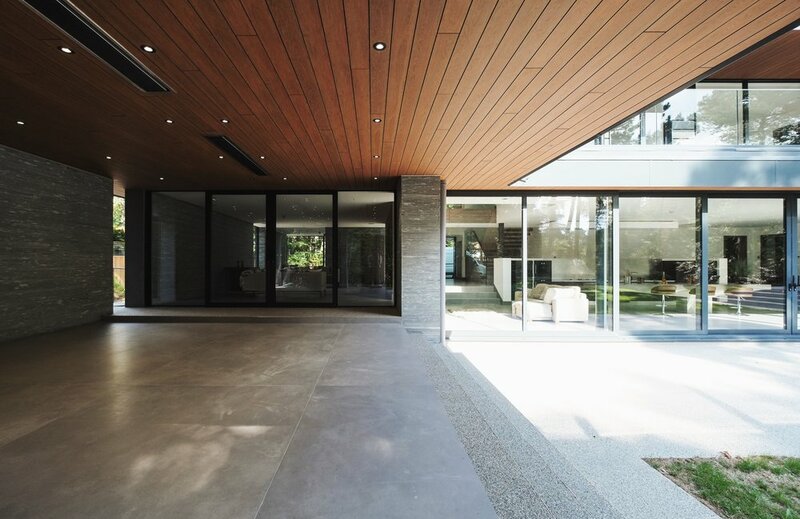 Large format tiles were used throughout this project both internally and externally. 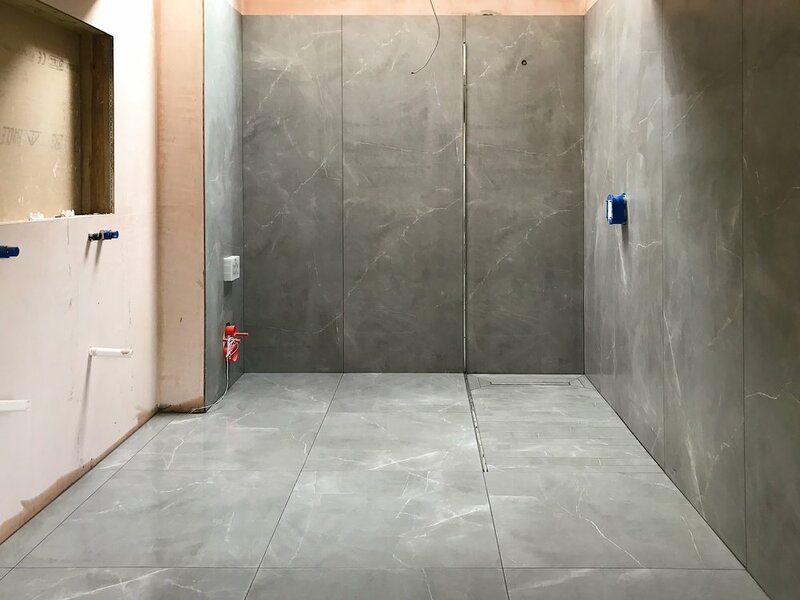 Primarily used for the flooring, the large 3.2m slabs flowed seamlessly into the swimming pool area. 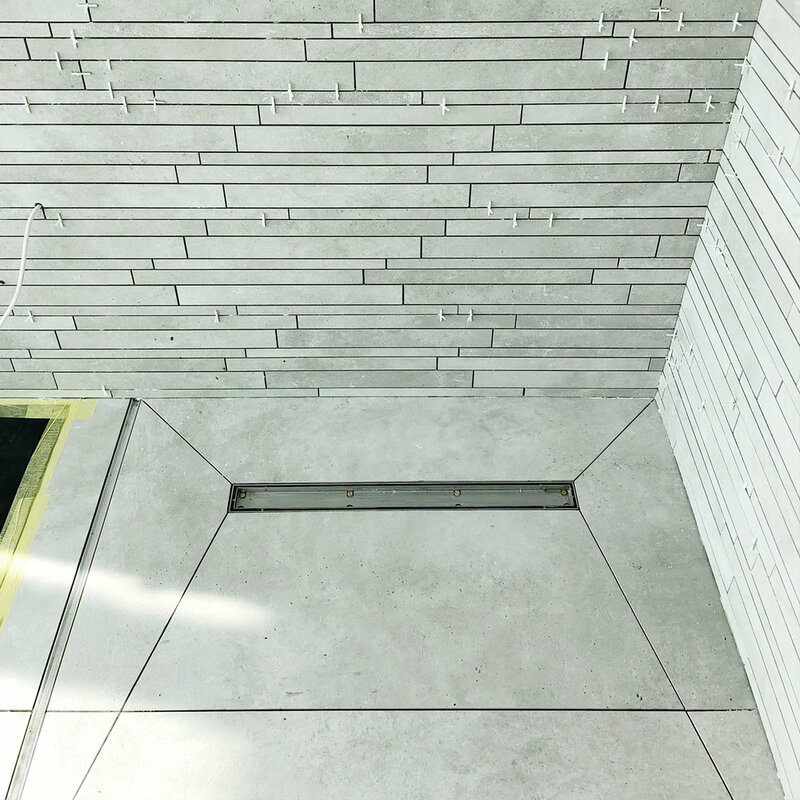 PietraCasa can supply or fabricate bespoke elements for swimming pools such as grates or pool edging. 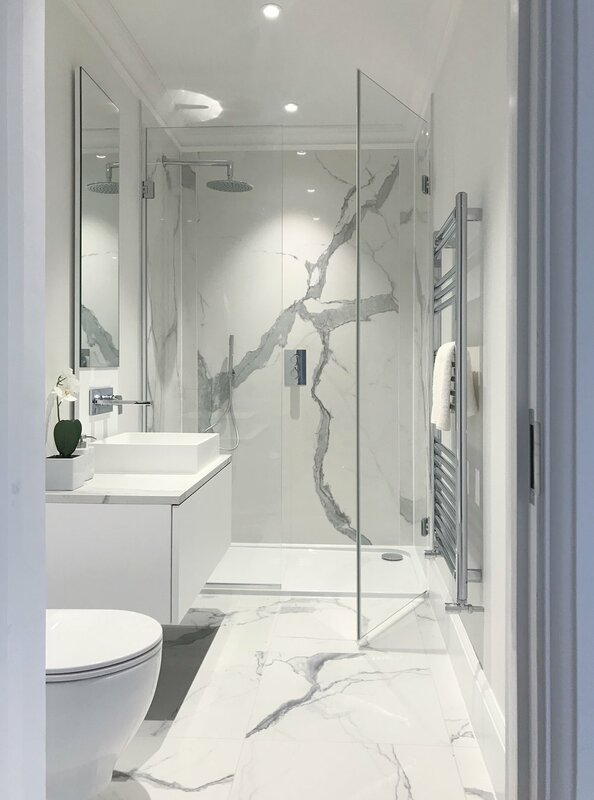 Though we specialise in large format porcelain tiles, we supply and install mosaics, 3D mosaics and staggered strips. 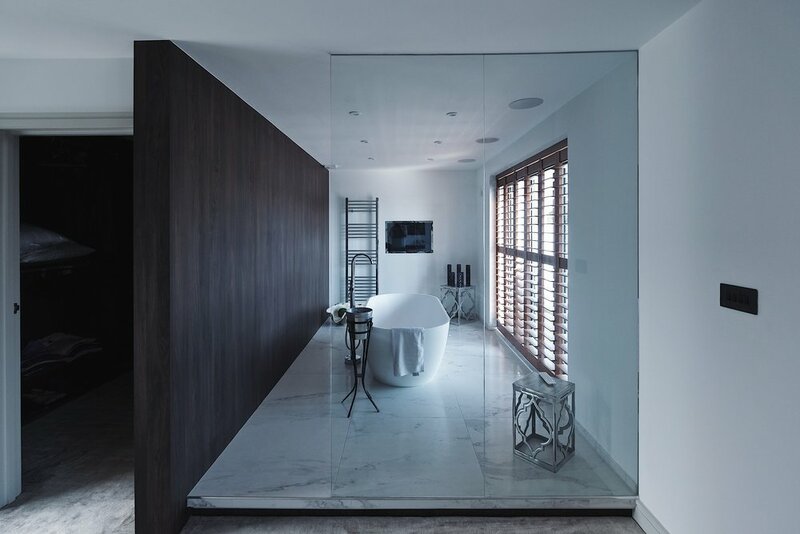 In this project, the architect specified staggered strips and 600x1200mm tiles. 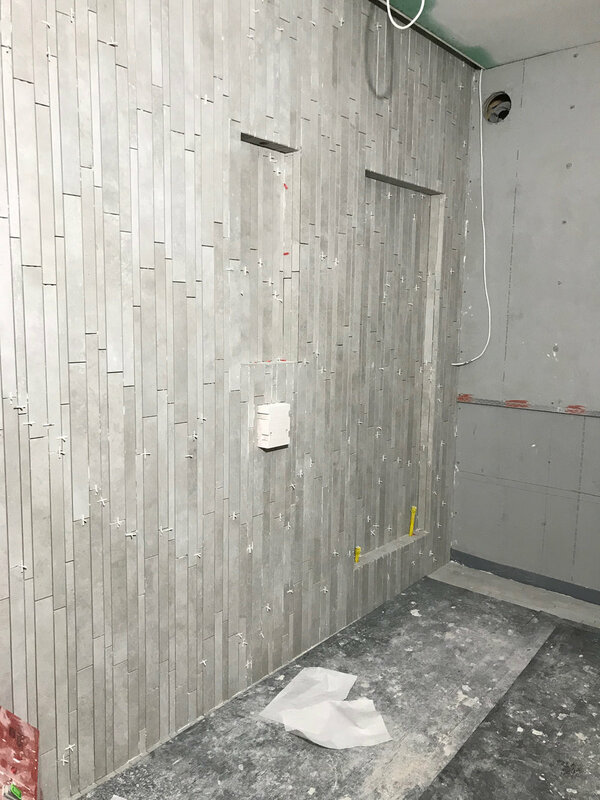 Throughout the project every niche and return has been mitred with the strip pattern retained. 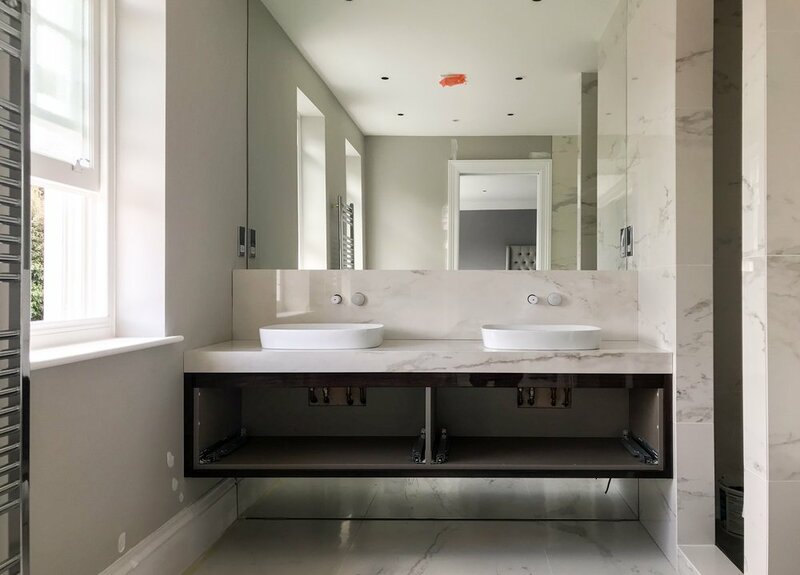 Though time consuming, the end result is a beautiful en suite bathroom. 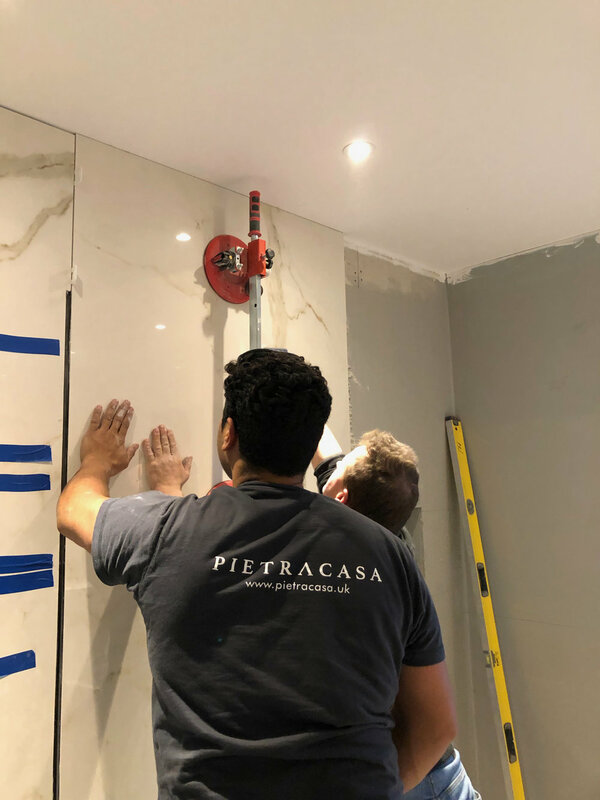 PietraCasa retail high quality porcelain tiles, supplying private clients, builders and developers. 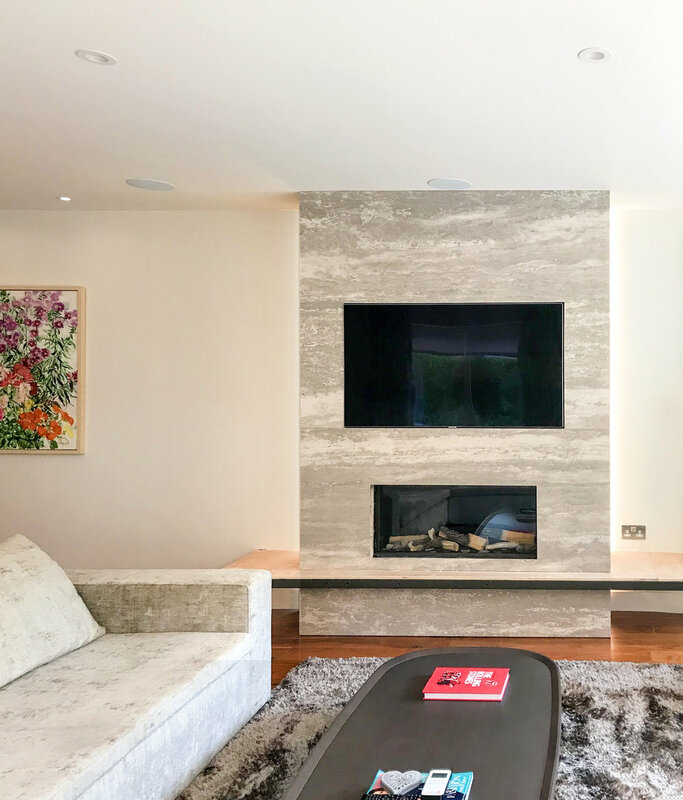 Increasingly architects are specifying our products in some of the best residential and commercial projects currently being built. 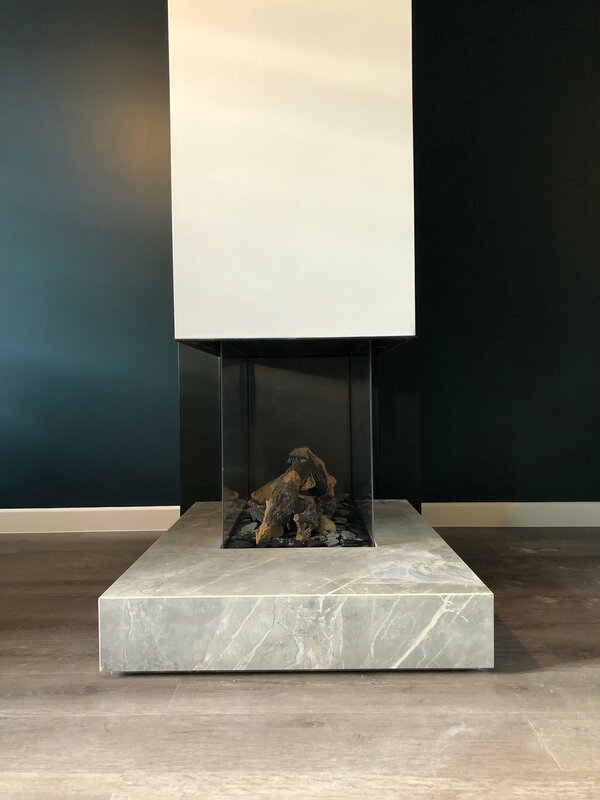 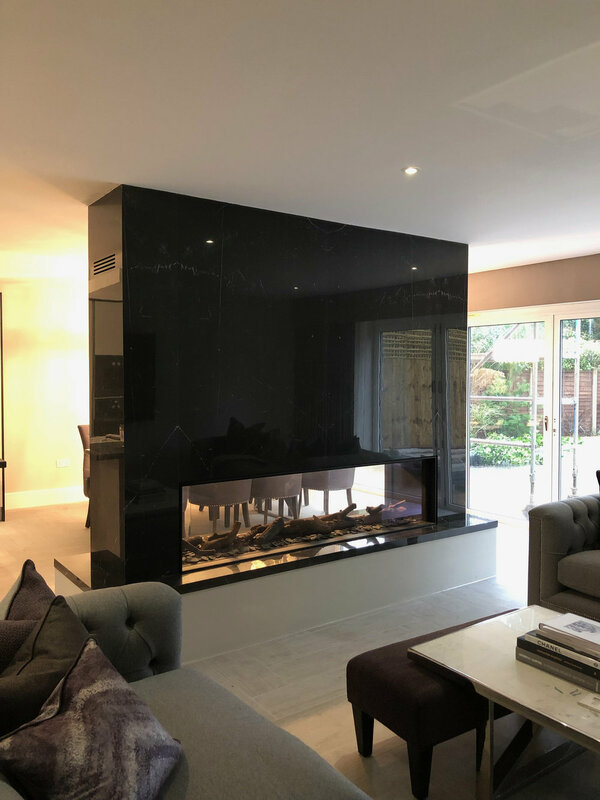 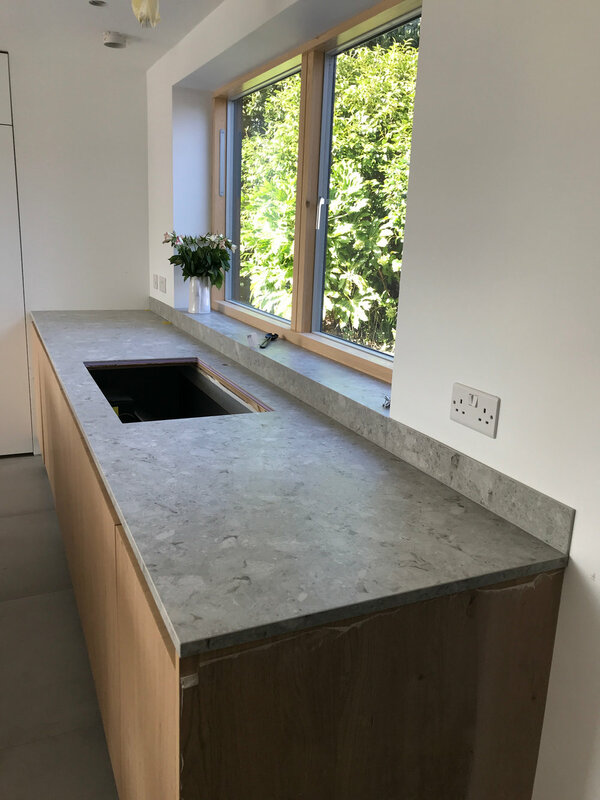 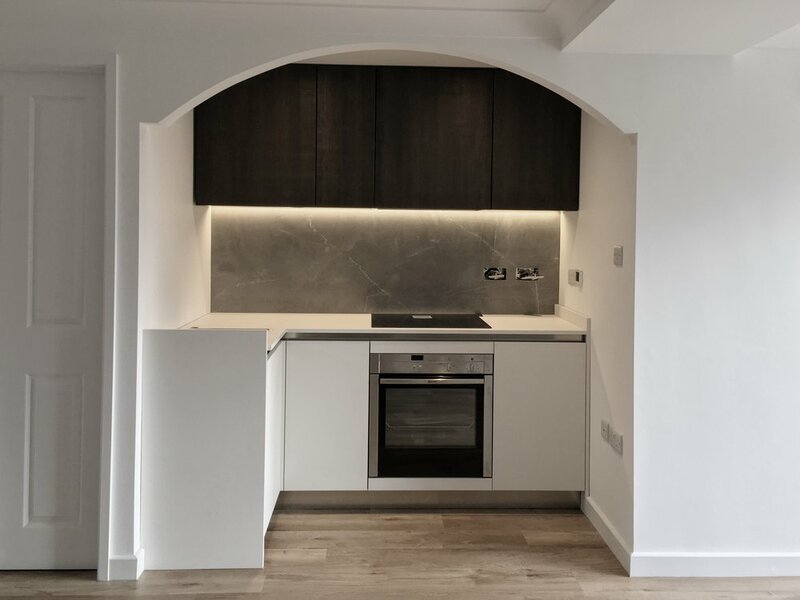 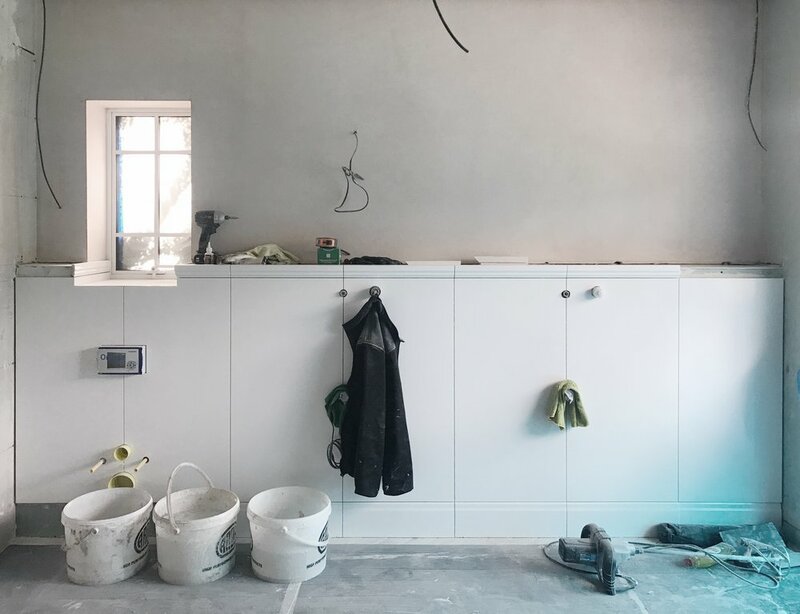 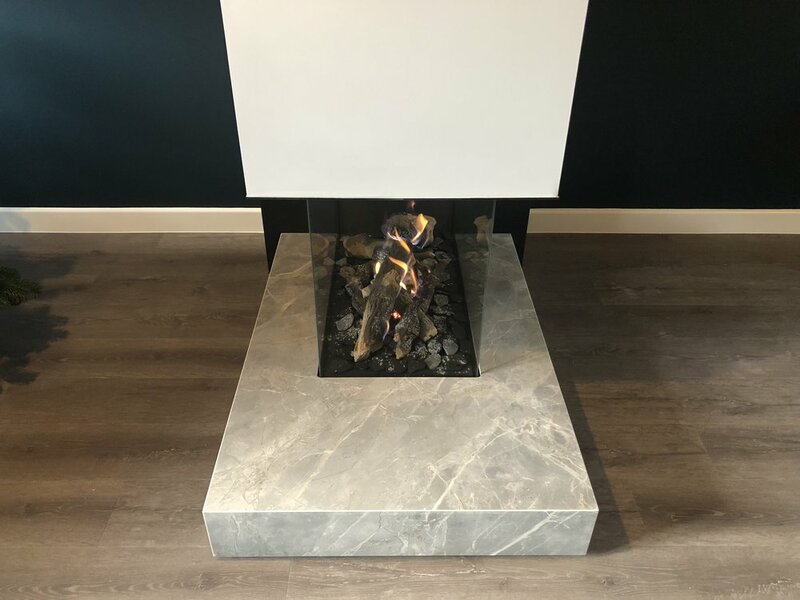 To support them and the contractor, we have extended our services to include installation using our own in house specialist team and selected contractors who have the same attention to detail.